Adam looks at the beautiful hand draw French Animated film The Girl without Hands. The film was written, directed and hand-drawn by Sébastien Laudenbach in his striking feature film debut. Many have a narrow view of what an animated film should be. General audiences feel animation is a genre (and not a style of filmmaking), only wanting cutesy things to fart or sing or a combination of both (if you’re an Illumination Animation Studio fan). Sébastien Laudenbach’s The Girl without Hands is when an artist brings the artistry back into animation in a deliberate way, the results are striking. The film is based on the Brothers Grimm Faire Tale of the same name. The Girl without Hands plays with the darker side of those Faire Tales without ever being maudlin. A farmer with dreams of gold makes a deal with the devil. The deal comes at a cost. That cost is the farmer’s virginal daughter. The young woman, who is never named, loses her hands and flees both the devil and her father. The story is a continuing trial of escalation by the devil to ruin or sully the young woman with the woman defiantly pushing back. Sébastien Laudenbach’s animation style perfectly suits this film. With heavy influence from the equally beautiful and engaging Belladonna of Sadness, Laudenbach’s work allows for the most harrowing scenes be more palpable though still engaging. The film is purposeful in its darkness, not wallowing in it for the sake of misery. Often times with films that go darker there is no purpose. Its bad things happen for the sake of bad things. Laundenbach keeps his story always at the forefront, never forgetting why this is happening. As the film was drawn entirely by the director this is a rare instance of a director in complete control of the story. It’s fascinating the results this has produced. Laundenbach’s has a surprising amount of sensuality that may shock some reviewers. The storytelling is mature in a way that most live-action films are not. 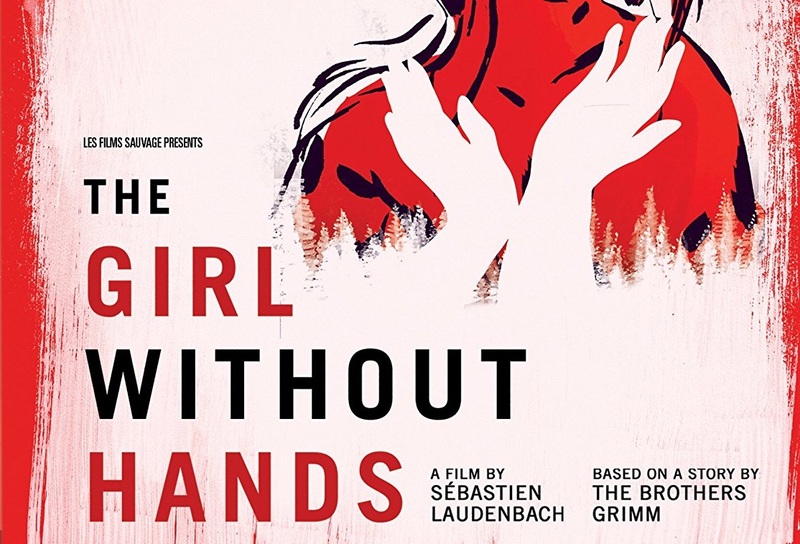 The Girl without Hands and its characters draw a distinct, beautiful and unique often-told story of a bargain with the devil gone awry. GKIDS has taken care in producing an excellent transfer that showcases the beautiful work by Director and Animator Sébastien Laudenbach’s. The transfer is razor sharp and nary a hint of edge enhancement or DNR. Bravo to GKIDS for their continued archival work with transfers. The Making of is more of an interview with Sébastien Laudenbach and how the project came to be. It’s a fascinating close to 30-minute interview (with subtitles) with Laudenbach. He primarily discusses the strange road that took him to go from looking to create a big budget version of the story (based on the play version of the same Grimm Faire Tale) to hand drawing the film over the course of a year in Italy. This is the type of material after seeing such a striking film will be required viewing. The interview is actually from what appears to be an EPK for the Ceasar’s (the French equivalent of the Oscars). Much of the same ground is covered with Laudenbach in this interview though it has more commentary on the themes and reception of the film. GKIDS in a masterstroke included five of the director’s short films. These definitely should be views post-first film viewing. They make a great companion piece to the feature itself. Each of these films shows Laudenbach’s unique sensibilities as an animation director. It also shows the evolution of a bold new talent. The Girl without Hands is a striking animation debut by Sébastien Laudenbach. Those adventurous enough to take the plunge will be rewarded. DEFINITE RECOMMENDATION! GKIDS’ Blu-Ray edition of The Girl without Hands is available February 20th!